Available on Vimeo - Buy and watch online now! The complete series is available for streaming on your computer, smart phone, or tablet. You will never look at Cow Horse in the same way! Cow Horse has always challenged the greatest horseman, while providing the exhilaration of a great run, the humility of the cows not going your way is always a possibility. For Todd Bergen, a 4.5 million dollar money earner in NRCHA, NRHA, NCHA and AQHA it is Cow Horse that fuels Todd’s true passion– it challenges his superb horsemanship every time he gets in the saddle. This video is packed full with over 5 hours of instructional and training tips, from the most important fundamentals to full speed fence runs. 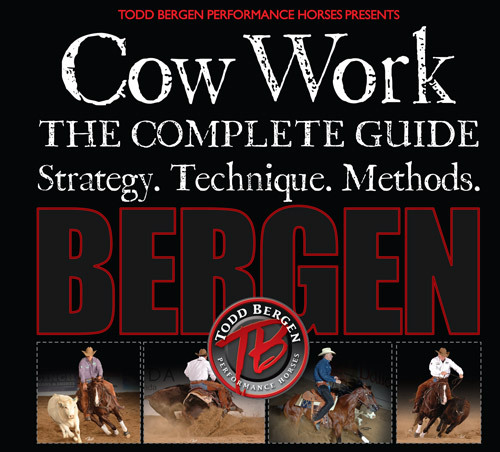 Todd will show you how to balance your horse to get the best performance to maximize your success in Cow Horse. He will give you his insight on strategy and decision-making that is crucial in herd work and going down the fence. This is done on horseback to show correct “Position” and Todd will also provide you a voice over commentary of some of his actual show runs in both the herd & fence work. He puts you in his saddle and explains what he and his horse are thinking as it happens– an amazing perspective. This video will benefit anyone from the first timer to a top level competitor in understanding how to get the most out of your cow horse experiences. “If your horse is soft, balanced and thinking you will get the most performance out of your horse, while providing a higher level of safely working around cattle”. The horsemanship Todd demonstrates on how he teaches his horse to think and to learn the maneuvers will help anyone that is involved with horses, breeders, spectator, fans, owners or riders of different disciplines.